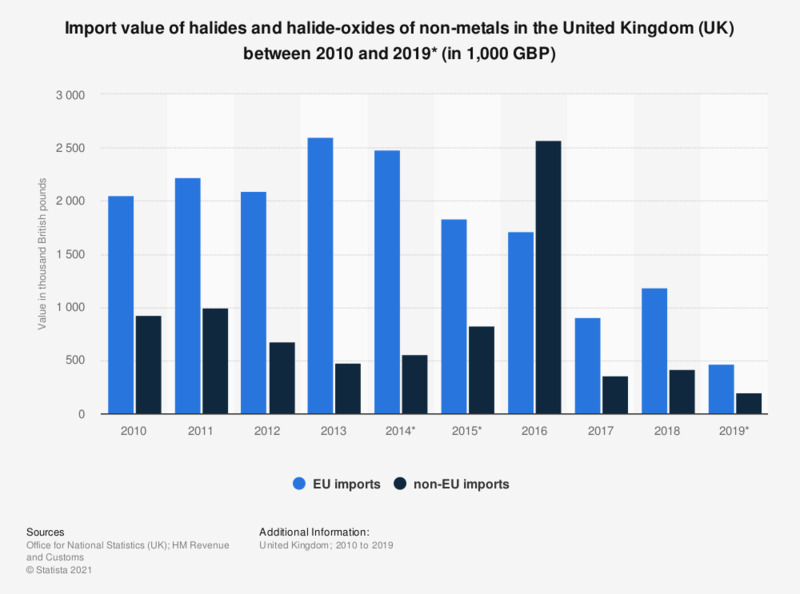 This statistic shows the value from EU and non-EU imports of halides and halide-oxides of non-metals in the United Kingdom between 2010 and 2018. The EU was clearly an important trade partner for the United Kingdom over this period. EU imports of halides and halide-oxides reached a value of 909 thousand British pounds in 2017. *As of February 2019 as the final figures might not yet be released. * Values for 2014 and 2015 were published and based on the methodology provided by the HM Revenue & Customs. Halides and halide-oxides of non-metals excluding chlorides and chloride oxides of phosphorus.